Note 3: I am generally not a big fan of 1-on-1 fighting games; they’ve never really peaked my interest as much as Run ‘n Gun games or Beat ‘Em Ups, and that’s why I don’t have many that are reviewed on my website (see Fatal Fury and TMNT Tournament Fighters) Therefore, I apologize if this review is rather bare-bones in terms of depth. It is written from the perspective of someone who doesn’t have much experience with these types of games; if you want a more in-depth look at the game, I’m sure there are other reviews online. 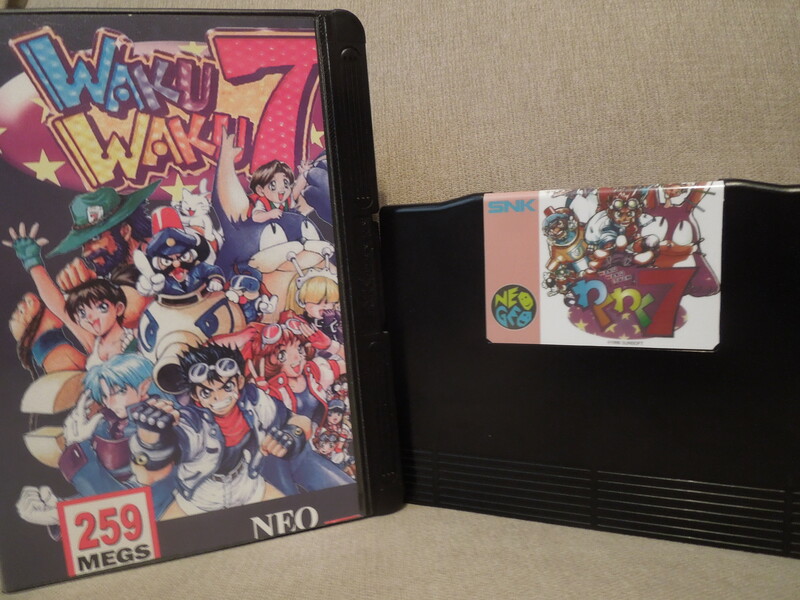 Quick History: Waku Waku 7 was released by Sunsoft for the Neo Geo MVS arcade cabinet in 1996. It is the sequel, of sorts, to a previous Neo fighter called Galaxy Fight. 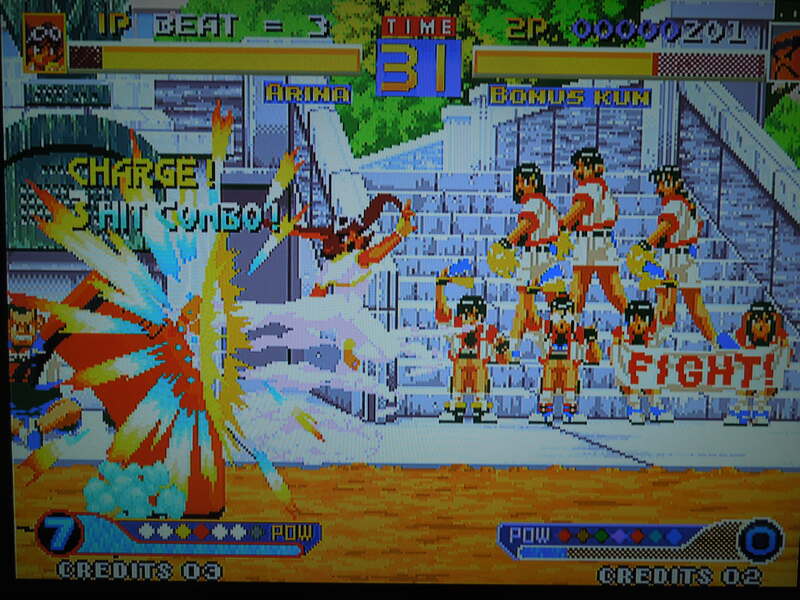 It was never released for the Neo Geo AES home console in the United States, but today many MVS games have been converted to AES format for play on the home console. The copy of Waku Waku 7 used for this review is an AES conversion. The game was also ported, in Japan only, to the Sega Saturn. That version, so I’ve read, is known for having somewhat overly pixelated backgrounds but amazing artwork ‘bonuses’ included. Waku Waku 7 was never officially released for the AES in the U.S.
Memory Card Support? Yes. After you use your 4 alloted Credits, or after you choose not to continue, you’ll have the option to Save your game, allowing you to return to the stage you were last on. Options: Before selecting your fighter, you can set the difficulty from Easy, Normal, MVS, or Hard, and you can select English, Spanish, or Japanese as your primary language. You can also select whether you would like to have your character (and opponent) ‘auto’ charge before attempting Specials or ‘manually’ charge before attempting Specials. Story: 7 different fighters are searching for the legendary 7 Waku Waku balls. Should someone collect all 7 balls, he or she will have his or her most heartfelt wish granted. 7 unique characters are available (9 in 2P VS). Characters: Fernandez, Rai, Slash, Tesse, Politank-Z, Mauru, Dandy-J, Arina, and BonusKun – what struck me as incredible upon first playing this game was the overall bizarre nature of some of the 7 selectable characters (9 are selectable in 2P VS). The fighters all have an extremely bright, anime-style look to them, and it works incredibly well. 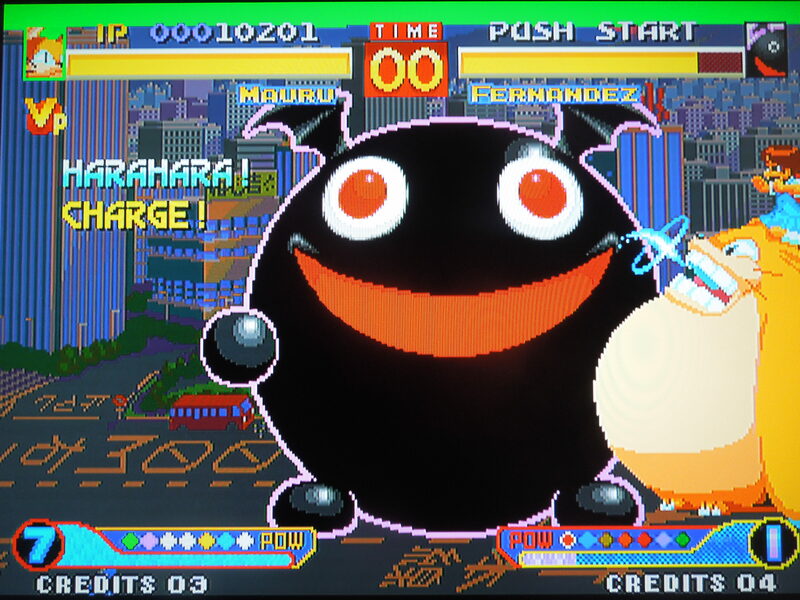 Among the more ‘strange-looking’ characters are a punching-bag character (BonusKun), a giant rabbity-thing (Mauru), and a giant black ball/bat thing that reminded me of the Chomp character from Super Mario. When you select your character, one great feature of this game is that it shows you the movelist of your fighter, including Specials. Backgrounds: The backgrounds of each character’s stage change from day to dusk to night throughout the 3 rounds, which is a nice touch. Control: The control in this game, as far as executing Specials and Super Moves, is excellent. I had no problem throwing projectiles, dragon-punches, and other moves. The fluidity of the controls is spot on with the smoothness of the animation on screen, I might add. Special moves are simple to execute and amazing to watch. Music: Fantastic. Really, really amazing. 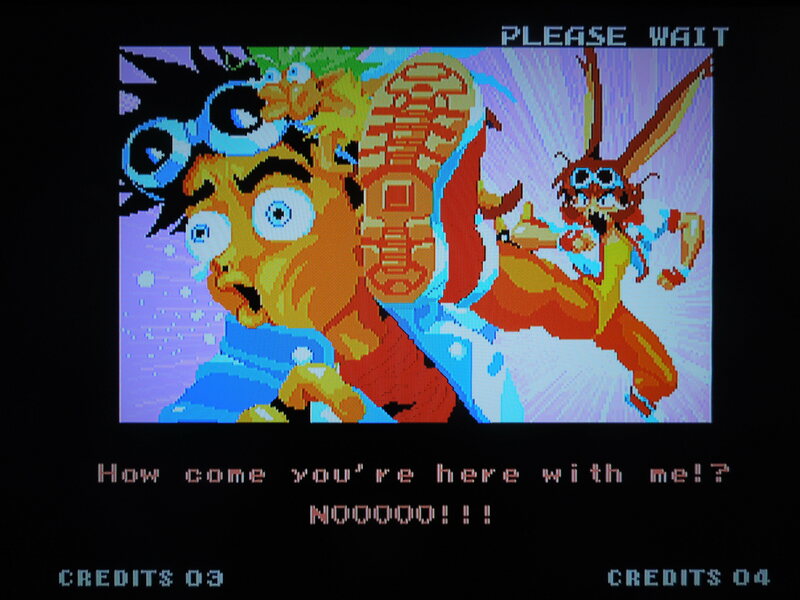 Of all the Neo Geo games I’ve played, this one has the best music by great lengths. Each fighter’s stage has its own unique track, and many are upbeat to accompany the fast-paced, frantic nature of the fighting taking place. An exception is the music in Tesse’s stage, which takes place in front of a giant manor; that track has a more slow-paced, somewhat-creepy vibe. 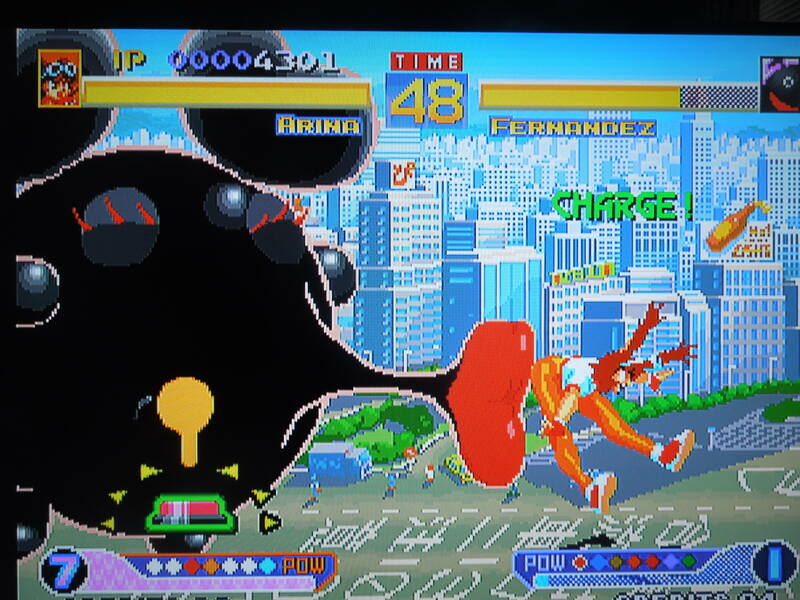 Arina’s stage is the best – an entire ‘super happy’ song is sung (in Japanese) throughout your 3 rounds; it’s really addictive, and stands out as the best single piece of music I’ve heard in any Neo Geo game. Battles start in the day and transition to night between rounds. 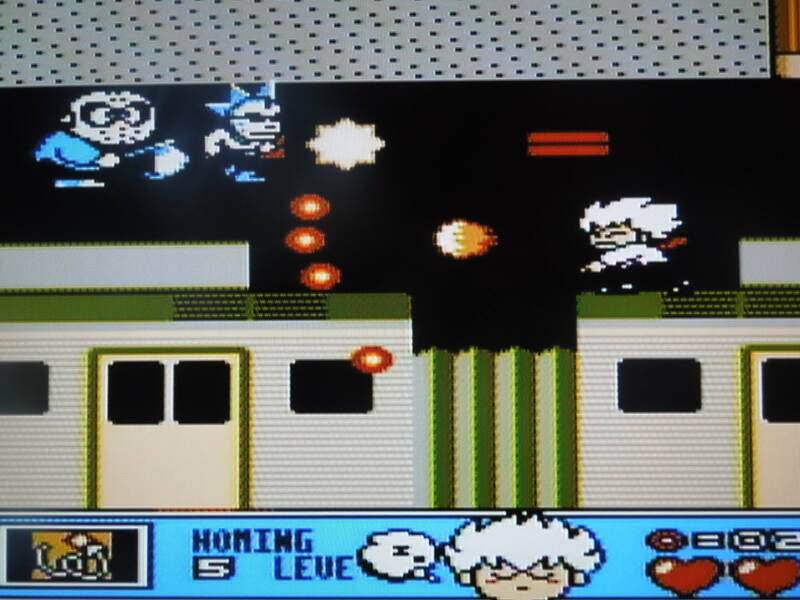 Moves: Each character has a wide-variety of moves at his or her disposal. Mastering the ‘Doki Doki’ and ‘Harahara’ super moves is both easy and fun-to-watch; the moves of some of the characters in the game look as bizarre as the characters themselves! Each character has a ‘charge bar’ at the bottom of the screen that slowly fills up as you fight (or you can select to ‘auto’ charge it from the Options). You’ll have no trouble putting together combos quickly and mastering a character, which is one thing I really enjoy about this particular fighter. 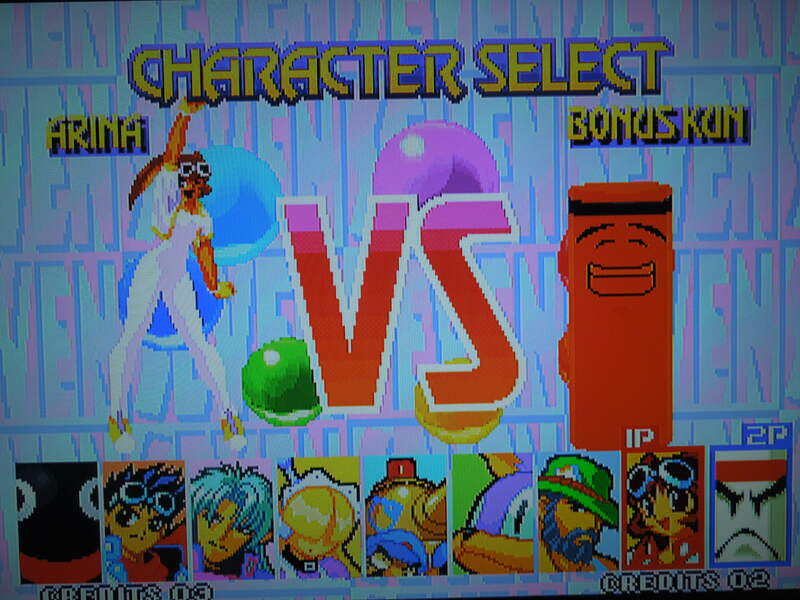 Bizarre characters execute beyond-bizarre moves in Waku Waku 7. 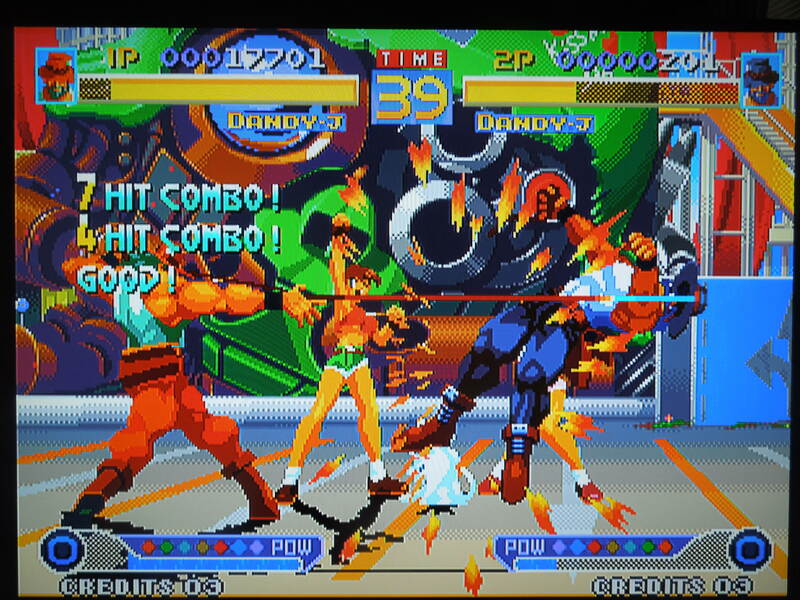 Conclusion: Waku Waku 7 is one of the best Neo Geo games I’ve ever played, and I’m admittedly not a fan of this genre of video games (1-on-1 fighters). This one, however, has the perfect combination of things I personally like: outstanding animation, wonderful music, easy-to-learn controls, a difficulty I can work with, and not-too-many selectable fighters! It’s kind of nice only having 7 to choose from and not an overwhelming number of selections – It forces you to learn one or two characters that you prefer instead of asking ‘Who haven’t I tried yet?’ again and again. It is obvious that the people at Sunsoft went more for quality over quantity here with regards to the number of characters.